Alissa Wilkinson was the 2017 ADM Visiting Fellow. She is a staff writer and critic at Vox, where she covers film, culture and, sometimes, religion. Alissa is also Associate Professor of English and Humanities at The King's College in New York City, where she teaches courses on criticism and cultural theory. Until September 2016, Alissa was the critic at large at Christianity Today and regularly contributed to a number of publications, including Rolling Stone, Vulture, RogerEbert.com, Pacific Standard, The Washington Post, The Atlantic, The Los Angeles Review of Books and Books & Culture. Her book, How to Survive the Apocalypse: Zombies, Cylons, and Politics at the End of the World, co-written with Robert Joustra, was published by Eerdmans in May 2016. A video of Alissa's public lecture can be found here. For a long time, religion wasn’t a topic of concern on our screens and stages. In the past few years, that’s changed — but it doesn’t look like most people were expecting it to. Why are we suddenly obsessed with religion? ADM’s 2017 Visiting Fellow, New York writer, critic and scholar Alissa Wilkinson, will take a tour through contemporary pop culture, uncovering the religious questions at the heart of our movies and TV shows. 2017 ADM Visiting Fellow Alissa Wilkinson will teach a masterclass based on her recent book with Rob Joustra, How to Survive the Apocalypse: Zombies, Cylons, and Politics at the End of the World (published by Eerdmans in May 2016). In their book, Alissa and Rob explore the history of apocalyptic literature and place pop culture - from Battlestar Galactica and Game of Thrones, to Mad Men and Her - into that framework. In doing so, they give a crash course in Charles Taylor's ideas in his books A Secular Age and The Ethics of Authenticity, and explore the implications for today. Join Alissa – a New York writer, critic and scholar – for a special masterclass designed just for you. This masterclass is for girls only, in school years 9-12. 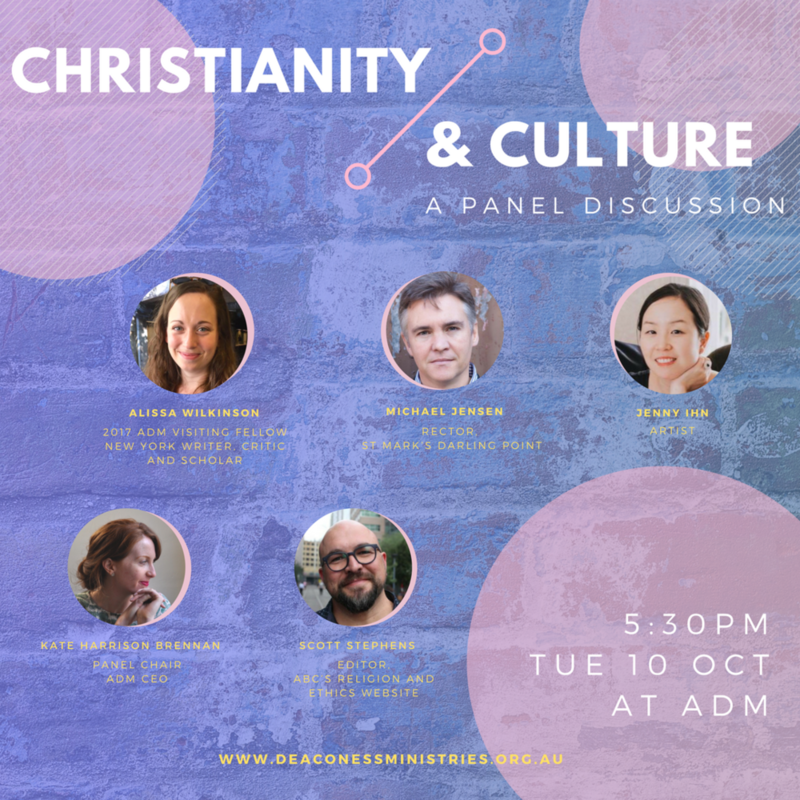 Join New York writer, critic and scholar Alissa Wilkinson, along with a panel of leading Christian thinkers and creatives for a unique evening of conversation about re-imagining Christian public engagement. Join us on 14 October 2017 for an Engage masterclass for women with our 2017 ADM Visiting Fellow, Alissa Wilkinson. Alissa will share practical advice and skills from her extensive experience as a prolific writer, scholar and critic.